WiMAX is the first standard technology to deliver true broadband mobility at speeds that enable powerful multimedia applications such as Voice over Internet Protocol (VoIP), online gaming, mobile TV, and personalized infotainment. WiMAX Security and Quality of Service, focuses on the interdisciplinary subject of advanced Security and Quality of Service (QoS) in WiMAX wireless telecommunication systems including its models, standards, implementations, and applications. Split into 4 parts, Part A of the book is an end-to-end overview of the WiMAX architecture, protocol, and system requirements. Security is an essential element in the wireless world and Part B is fully dedicated to this topic. Part C provides an in depth analysis of QoS, including mobility management in WiMAX. Finally, Part D introduces the reader to advanced and future topics. 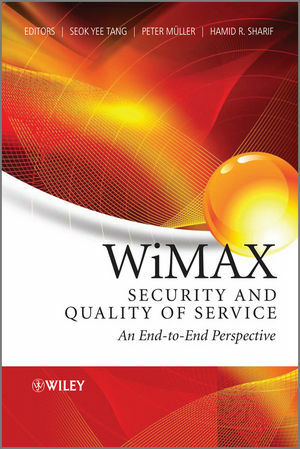 One of the first texts to cover security, QoS and deployments of WiMAX in the same book. Introduces the primary concepts of the interdisciplinary nature of WiMAX security and QoS, and also includes discussion of hot topics in the field. Written for engineers and researchers, answering practical questions from industry and the experimental field in academia. Explains how WiMAX applications’ security and QoS are interconnected and interworked among the cross layers. SEOK YEE TANG has specialized in wireless communications systems throughout her 23 year career, gaining research, practical, management and leadership experience for military, industry and academic applications. In recent years she has worked with a varied range of companies over three continents. Her wireless communications career started with servicing UHF and VHF and HF radio communications sets used for the communications link between the Air Communications Operations Officers and the Air Force Pilots. She also upheld several leadership positions in her military career. Besides her career in Singapore Air Force, she has also worked for Microwave Communication Inc (MCI) in United States. Other universities and companies she has worked for include Mobile Research Group in University of Surrey in United Kingdom, University of Puerto Rico, Institute of Infocomm Singapore, and NEC in United Kingdom. She has also been an active member of the Technical Program Committees for several international Wireless Communications conferences since 2005. Conferences that she has contributed to organizing include Globecom, VTC and Chinacom. In 2008 she left the corporate world and is presently a financial market trader and also an entrepreneur. PETER MÜLLER joined the IBM Zurich Research Laboratory as a Research Staff Member in 1988, and was appointed the secretary of the IEEE Technical Committee on Communications and Information Systems Security in 2007. His research expertise covers a broad range of areas from information systems architecture and simulation techniques to device physics and nano-science. He holds a number of patents, has published more than 50 scientific articles, books, special journal issues and proceedings, as well as serving as a government counsel and chairing many international conferences and workshops. DR. HAMID R. SHARIF is the Henson Distinguished Professor of the Computer and Electronics Engineering Department and the Director of Advanced Telecommunications Engineering Laboratory (TEL) at the University of Nebraska-Lincoln. His current research interests include protocols, security, OoS and performance evaluations in wireless communications and networks. He has authored and co-authored over 160 technical papers in major international journals and refereed conferences. He serves as Steering Committee member, Symposium Chair and General Co-Chair of many international conferences, and also contributes as the Editor, Associate Editor, or Editorial Board member for several journals. He is the Co-Editor-in-Chief of Wiley’s Security and Communication Networks and a senior member of many professional organizations including IEEE. As the current Chapters Coordinator for IEEE Region 4, he is also the past Chair of the IEEE Nebraska Section and past President of the IEEE Nebraska Computer and Communications Societies.